This is a quick reminder that the Xen Project is again participating in Outreachy (Round 11). Please check the round 11 page for more information about the December 2015 to March 2015 round of interships. Outreach Program for Women has been helping women (cis and trans), trans men, and genderqueer people get involved in free and open source software worldwide. 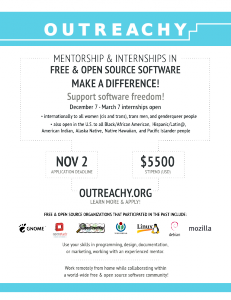 Note that the program has been extended and now also targets people from more groups underrepresented in FOSS: specifically the program is open to residents and nationals of the United States of any gender who are Black/African American, Hispanic/Latin, American Indian, Alaska Native, Native Hawaiian, or Pacific Islander. The application deadline for interns is November 2, 2015. For a list of projects for interns and more information on how to apply, check our Xen Project Outreachy portal. At the 2014 Xen Project Developer Summit, we ran a panel discussion that included OPW interns, GSoC students as well as mentors. You may also want to read Women interns rocking open source at Xen Project.